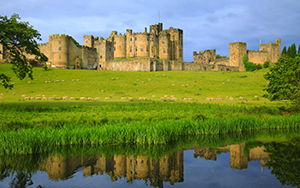 The North East is easily overlooked as a holiday destination, but the Northumberland coast has been classed as an Area of Outstanding Natural Beauty, the beaches are huge, and there are wonderful remnants from the past to fire your imagination. 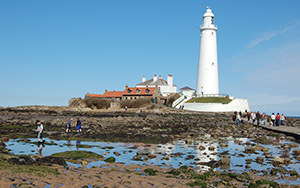 Any stay at Whitley Bay in Tyne and Wear demands days spent on the local golden sand beaches. 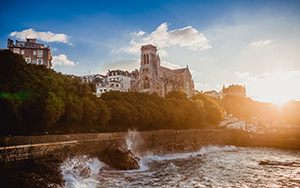 Our favourites include South Beach, Cullercoats Bay and Longsands Beach, which is popular with surfers. Berwick is the most northerly town in England ...their football team plays in the Scottish league.... Sitting so close to the border between England and Scotland, it is little wonder that much of Berwick's heritage reflects a turbulent history - including the town walls built to keep the Scots out. 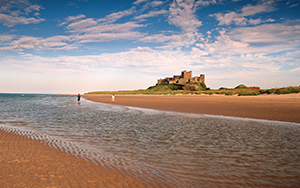 Bamburgh Beach is a regular winner of votes to find the UK's best beach - little wonder when you've experienced the sweeping sands watched over by Bamburgh Castle. More favourites in the region include the fishing village of Seahouses, the sands at Berwick, and the north and south beaches at Druridge Bay. 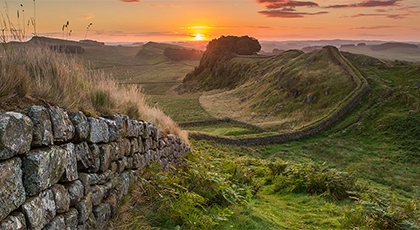 Northumberland once marked the northern limit of the Roman Empire - a boundary they marked with Hadrian's Wall, built as protection against the marauding Scots. 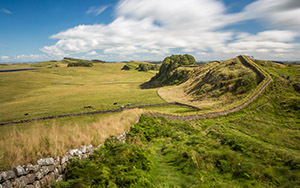 The remains are a World Heritage Site that includes Roman forts and archaeological sites. 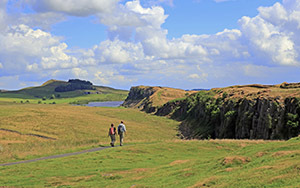 A large portion of Northumberland has National Park status, celebrating the tranquil landscape of valleys, hills and crystal clear rivers. With so few people living here, it feels like one of the few remote spots left in Britain. 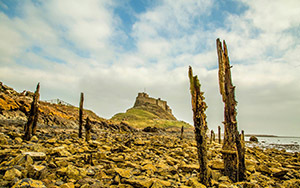 The Holy Island of Lindisfarne, just off the coast of Northumberland and only reachable at low tide, was considered the centre of Christianity during Anglo-Saxon times. There are still the remains of a 12th century priory church and a museum tells the story of ancient monks, St Cuthbert and a violent Viking raid that devastated the island.